Starring Jane Powell, Debbie Reynolds, Edmund Purdom, Vic Damone, Louis Calhern, Evelyn Varden, Linda Christian, Virginia Gibson, Nancy Kilgas, Dolores Starr, Jane Fischer, Cecile Rogers, Ray Collins, Carl Benton Reid, Howard Wendell, Henry Nakamura, Steve Reeves 'Mr. Universe of 1950', Kathleen Freeman, Richard Sabre, Ed Fury, Joe Gold, Bert Goodrich. 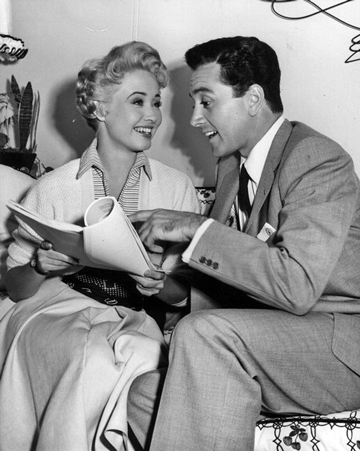 MGM musicals were not immune from the film industry's economic slide of the early 1950s. By 1954 the studio found itself no longer in a position to lavish money and resources upon finely tuned masterpieces, written, composed and performed by the best talent in America. Most of those folks were no longer on the payroll and couldn't be re-hired at the old MGM wage level. But spirited, funny and often musically adventurous work was still showing up, whether or not the public rallied as they once had. Gene Kelly and Stanley Donen's It's Always Fair Weather is a keeper, without a single bum musical number. And lumpy though it may be, I've always had a soft spot for Esther Williams' Jupiter's Darling, with its funny Hannibal march and Marge Champion dancing with a baby elephant. Athena is one of the better musical efforts of 1954 despite some drawbacks. Most all of the talent is agreeable and the premise makes an effort to be different. William Ludwig and Leonard Spigelgass's screenplay takes its cue from the growing "health nut" craze and its attendant practices of vegetarianism, exercise and body beautiful worship. The script rolls these up into a non-conformist bundle that includes numerology and astrology, and makes one dialogue reference to nudism. 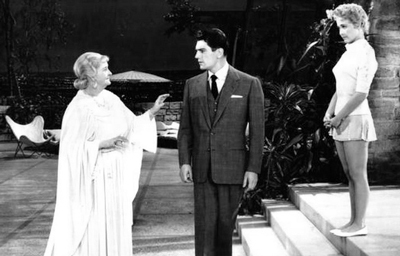 Successful attorney and budding politician Adam Calhorn Shaw (Edmund Purdom of The Egyptian) is engaged to the upscale Beth Hallson (Linda Christian, very gracious in her thankless role) but falls fast for Athena Mulvain (Jane Powell), a fellow customer at the nursery who volunteers to properly plant Adam's new peach trees. Athena shows up at Adam's house unannounced and uninvited, practically elbowing Beth aside, because the numbers and the stars, as predicted by her Grandma Salome (Evelyn Varden, complete with vocal mannerisms from Night of the Hunter) have destined Adam to be her husband. Instead of getting a restraining order, Adam decides that he likes Athena. He discovers that she is but one of seven Mulvain sisters, all given classic names: Niobe, Aphrodite, Calliope, Medea, Ceres and Minerva (Virginia Gibson, Nancy Kilgas, Dolores Starr, Jane Fischer, Cecile Rogers & Debbie Reynolds). The Mulvains run a health food store and worship nature and healthy eating in a classy hilltop estate; Granpa Ulysses is an athletic 78 and has been training a small group of body-beautiful musclemen (Richard Sabre, Ed Fury, Joe Gold, Bert Goodrich). The strongest of all, Ed Perkins (future Hercules Steve Reeves, billed as 'Mr Universe of 1950') is soft on Athena and becomes jealous when she takes up with the cultured Adam. The spirited Minerva sets her sights on Adam's legal client, pop crooner Johnny Nyle (Vic Damone). All is rosy until Adam's political advisors object. Will Adam's society friends accept Athena, and will the voters accept his new 'kooky health nut' way of life? Salome's prognostications indicate trouble ahead. The Mulvain family is the closest MGM came to describing a "cult". Everybody they meet must be inculcated into a new healthy lifestyle. The common greeting is "I love you", which the Mulvain sisters even say in Japanese to Adam's friendly houseboy. Johnny Nyle is heavily criticized for endorsing beer and meat products. Outsiders Adam and Johnny are bullied and insulted into complying with the Mulvain creed, a process that reminds me of brainwashed friends trying to talk me into an est-like organization back in the 1980s. Salome and Ulysses are even planning out Athena's children for her. As a musical Athena gets a pass. The new songs are spirited and pleasant ... and not all that memorable, not even the Mulvain's cute family theme Harmonize or the homily Love Can Change the Stars. Jane Powell's best moment is singing Donizetti's Chacun le sait with all those fast high notes. It furthers the story in that Athena uses it to charm Adam's society friends. On the other hand, Vic Damone's unrelated songs simply showcase him as a singer and do nothing for the show. He does a cover of The Boy Next Door, a Judy Garland standard, but a staged number called Venezia lays an egg. Now if it had been about Venice, California's Muscle Beach, it might have fit in better. The film's choreography is like synchronized calisthenics and agrees with the theme of exercise. The song arrangements are fairly standard, with nice touches. We can hear credited orchestrator Robert Van Epps trying to stay current -- one song uses Les Paul-like guitar music accents. Yet when Johnny Nyles' teen audience rushes into the TV studio, they all look like '40s- style bobbysoxers. Hey, James Dean is probably already inventing the moody teen rebel, just over the hill at Warners. By the finish Athena has become another attraction for MGM musical fanatics that love all of the studio's output. Debbie Reynolds charms her way through her relatively small part and comes out unscathed. But just when Purdom and Powell begin to generate some pleasant feelings, the screenplay goes into a tailspin. The political theme is dropped, even though we'd think that the sight of Adam judo-tossing Steve Reeves' Mr. Universe on Television would make him an unbeatable candidate. After supporting the health cult for 80 minutes, the movie suddenly has both Granpa Ulysses and Athena act like jerks, completely against their policy of Love Thy Neighbor. Athena offers to cook ham and eggs, a hollow gesture that undercuts her core values. But I guess it's a bluff, because the movie simply dissolves to a happy ending. In the immortal words of Rosalind Russell, everything comes up artichokes. The Mulvains are inspired, no, they're phonies, no, they're okay after all! Athena doesn't pretend to offer profound wisdom, but a little consistency in characterizations would have helped. Richard Thorpe's directing is again as impersonal as one could imagine. It's as if Leo the Lion directed the show, which is probably how the front office wanted things anyway -- no time wasted on artists like crabby old Fritz Lang. I'd wager that ace cinematographer Franz Planer is responsible for making the shots tie together and giving the show what glamour it possesses. The actresses playing the other five sisters were probably chosen for their dancing skills, and barely get one line of dialogue each. Forget close-ups. Steve Reeves gets no closer than a tight two-shot, and he doesn't show any great skill at delivering a dialogue line. But we're told that the sight of Reeves hefting a monstrous barbell so exited an Italian teenager, that her father offered him the leading role in Hercules. 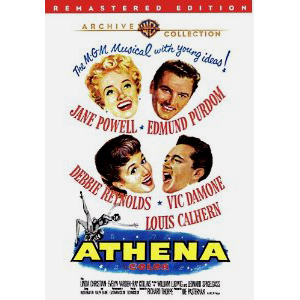 The Warner Archive Collection DVD-R of Athena is an excellent, colorful enhanced rendering of this early widescreen production. The box calls out the Aspect Ratio as 1:85. Picture and sound have no problems and the transfer people have pulled out good color values. Eastmancolor from this year can get dodgy as it was limited to one or two stocks and was still hue-stubborn and a bit grainy. Original prints were in Technicolor. The disc looks as if it were prepared for standard DVD release, with its own custom menu screen and extras. (Wrong! see footnote 3.) The trailer touts the film as an "MGM musical with young ideas!" but starts with save-the-studio Leo the Lion-themed animation. Several unused musical numbers are provided, apparently by synchronizing recovered audio playback tracks with full daily rushes. The most interesting is "Competition Dance", a selection of uncut outtakes showing all seven sisters dancing in a gym setting. Although it's not exactly Gene Kelly time, the synchronized patterns include some pro ballet dance moves. Budding editors can study the several overlapping angles and formulate a plan for cutting the scene together. Maybe MGM did and the dancing looked flat, or maybe the money ran out for developing the track, or maybe the need to put in another Vic Damone song edged the dance number out. I'm sure some informed fan knows. The IMDB quotes a much longer original running time, without any explanation. I'm assuming that's an error. 1. Adam meets Athena at a nursery. As a particular cupola building in the background looks familiar, the nursery may be one that was on the old Los Angeles Gilroy site, behind the Farmer's Market, where The Grove is today. 2. In 1997 I had the fun assignment of helping a friend interview Mickey Hargitay and Gordon Mitchell on video. Hargitay made his final fortune in real estate and lived atop a Hollywood hill. Mitchell we found filling in for someone at Gold's Gym, content and in good spirits. At 74 years of age, he still looked capable of pulling the whole building down. 3. I have learned that Athena represents a significant "WAC upgrade" -- a lot of work was done specifically for this release. It has been remixed to Stereo. The impressive outtakes are a new discovery as well -- they had been located prior to That's Entertainment! III but later it went missing. The impressive extras on Athena are not from an unreleased standard DVD; the disc is an original "Warner Archive Collection" production.